Happy Halloween. In the realm of trick or treat, today was a trick. Fridays are usually a treat because I can work from home and save up to four hours of commuting time. I take advantage of this extra time by going out for a morning run where I can cover 3-4 miles and still keep to my workday schedule. Instead of working from home today, I needed to go into the office. I didn't mind, but I was disappointed to lose my opportunity for an outdoor run. I'd set up my gear for an early morning treadmill workout, but when I got up, I wasn't in the mode to do it. I regret it now, but this morning I felt too tired to run. I had to go through the humiliating process of putting my workout clothes back into drawers. I felt guilty about that, but not enough to change my mind. Due to missing today's run, I'll likely have a low mileage week. The weekend weather does not look promising and it may interfere with my running. I think the NYC marathoners will face some tough conditions as cold temperatures and high winds are predicted for Sunday. Getting outside for a long run tomorrow morning would be treat. I've had more than enough tricks today. 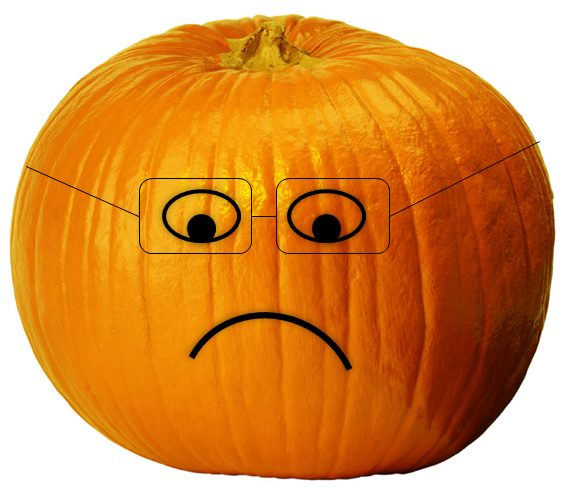 That pumpkin has some stylish glasses! I was hoping to get closer to 30 this week, but today's weather may put a damper (ayuk ayuk) on those plans. I may drive to Plainview for a good den workout. It's a fashion forward gourd. I didn't let the rain didn't dampen my spirit this morning : ) I decided to go out even though it was really coming down. The indoor track is waiting for you despite your refusal to accept the correct geography.